Sheets are among the most intimate sleep accessories we use. We rub our bodies all over them, share them with our partners, and change them with the seasons. Not to mention, they dress the most important piece of furniture in our bedrooms — the mattress! So, when you’re on the hunt for the perfect sheet set, it’s important to make sure they are compatible with your bed, your body, and your lifestyle. I’ve slept on the Casper mattress, I’ve rolled around with the Casper pillow, and now it’s time to break into Casper sheets! 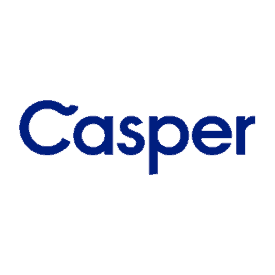 In this review, I’ll take a close examination of Casper’s Cool Supima Sheet Set. 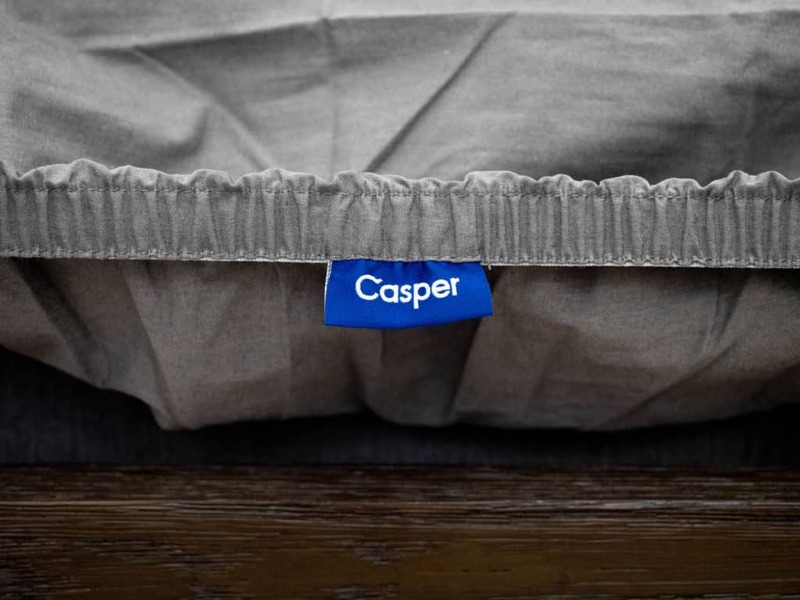 The folks at Casper say that, after much research and development, these sheets are “sublimely balanced.” I’m ready to put that claim to the test as I explore the good, the bad, and the oh-so-cozy. Don’t worry if you don’t have time to read my full review, you can click here to skip to the review summary! 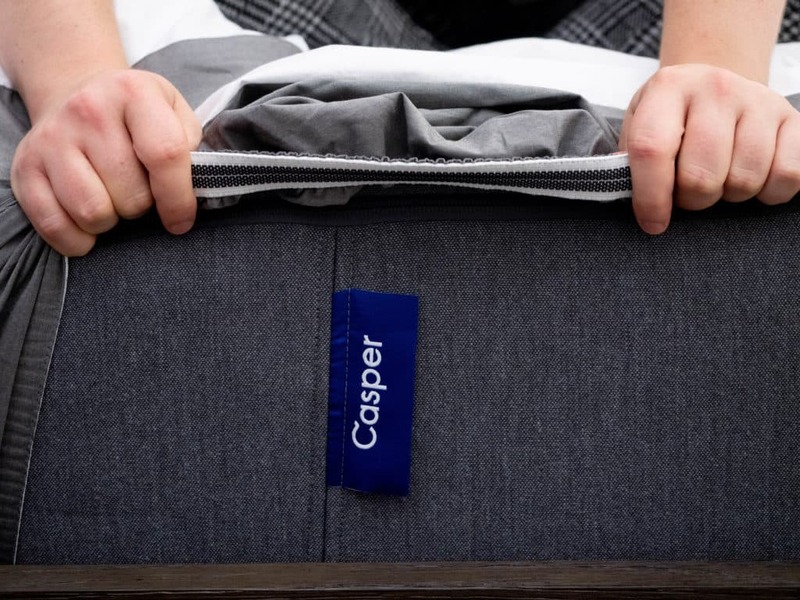 A soft, crisp feel makes the Casper Sheets ideal for those who like to sleep cool. Each set comes with a fitted sheet capable of accommodating a mattress up to 14 inches deep, two pillowcases, and a top sheet. On the back of the packaging, you’ll find some basic information about the size of the set, the color combination you chose, the materials used, and the country of origin. The particular sheets I’m reviewing is a Queen size set in the white/chambray color combination. While this particular color combo most closely resembles the Casper mattress, this set also comes in white, nazy/azure, sky/azure, and grey/slate. HOW DO THESE SHEETS FEEL? As you might have suspected, these sheets are made from 100% Supima (also known as Pima) cotton. 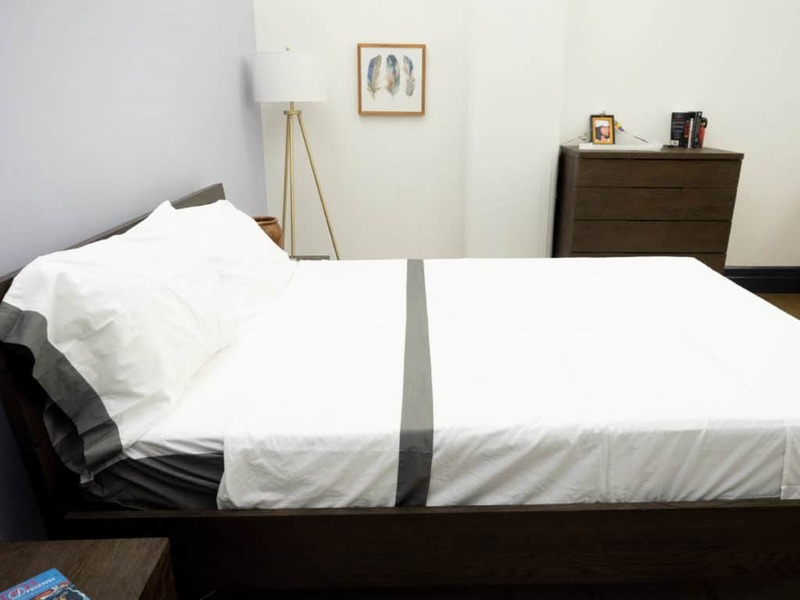 They feature a 400 two-ply thread count, which the folks at Casper say offers a “sublime balance.” However, Casper is one of many bedding brands that urges consumers to understand “the truth” about thread count. Many of us have been taught to assume that the higher the thread count, the better the sheets. But there’s a lot more to consider! For example, when you’re shopping for sheets online and you’re wondering what they feel like, pay attention to the specific fabric being used, the type of weave, and the length of the fibers themselves. Speaking of fibers, the Supima cotton used in these sheets features long fibers (often referred to as staples), which serve to enhance durability, softness, and just bump up the cozy-comfort factor. This sheet set feels super smooth to the touch but also very crisp. When I think of crisp, white, cotton sheets, this is the kind of set I imagine. That being said, they are so smooth and crisp that the material actually does make a soft rustling sound when you rub against it, or rub the sheets against each other. I’m a pretty deep sleeper so it doesn’t really bother me, but if you’re sensitive to midnight sounds, this could be something to be aware of. This Casper sheet set is percale woven which enhances the crispness and gives them a cool handfeel. They are lightweight and feel very breathable which is going to be particularly beneficial for warm sleepers. I generally sleep pretty warm at night, so I could definitely see myself using the top sheet as a blanket in the summertime. As I said, each set includes one top sheet, one fitted sheet, and two pillowcases. The fitted sheet is able to fit mattresses up to 14 inches deep, so I had no problem fitting it on the Casper mattress which is 10 inches deep. 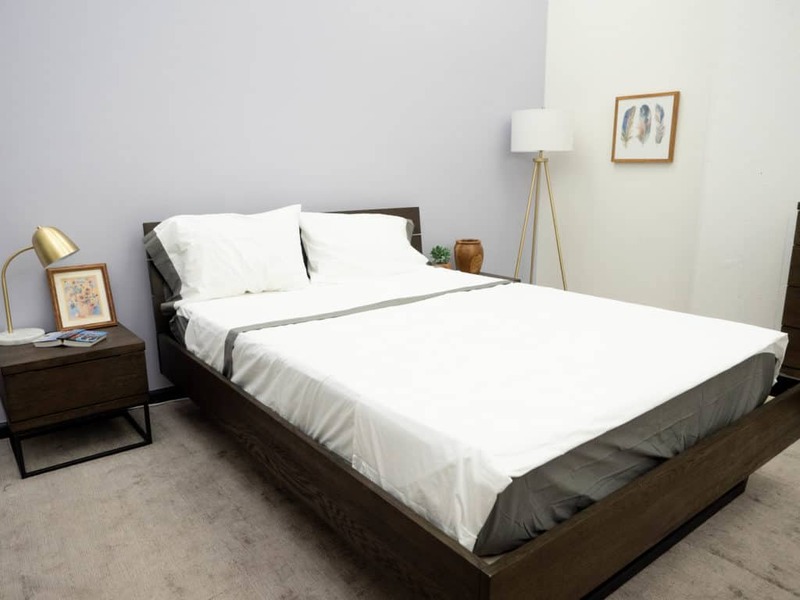 Of course, you don’t need to use the Casper mattress to enjoy these sheets, but there is an attractive style coordination between the mattress and Casper sheets. This sheet set comes in a variety of color combinations, but I like the white/chambray option the most because it mimics the color scheme of the Casper mattress. The fitted sheet also features a rubberized elastic band that grips the mattress very tightly, so I definitely got the sense that I could roll around in bed for hours and it would never become untucked. Big perk in my book! The band is thicker and more responsive than other fitted sheets I’ve tested, and as you stretch it and let it bounce back, you can feel its durability. HOW DID YOU LIKE THESE SHEETS, SARAH? 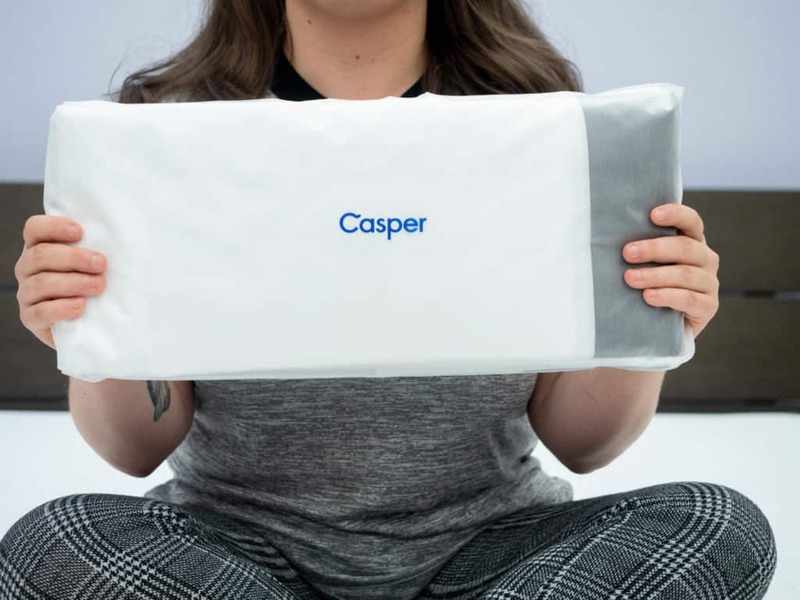 I’ll be honest: I do love the Casper mattress and the Casper pillow, so I was pretty excited to test these sheets. This sheet set arrives in plain, plastic packaging bearing the company’s logo and some basic info about the bedding. The package is pretty small and compact which is great if you’re going to store them away in your linen closet rather than use them right away, but I imagine it’s pretty tough to fit them back in the bag once they’re out. As soon as I released these sheets from the package and fanned them out over the mattress, I could feel how soft and very crisp they are. Right away, they reminded me of the sheets you sleep on at a fancy hotel. They are vibrantly white, super smooth and, like I said, the chambray trim adds an attractive touch. Putting the fitted sheet on the bed was easy, and I had plenty of excess fabric to spare. So, I tucked the extra fabric under the mattress to make sure the fitted sheet tightly adhered to the bed and there wasn’t any gapping between the sheet and the mattress. The rubberized elastic band on the fitted sheet is extremely responsive and pretty thick. Between that band and the extra tuck of fabric under the mattress, I could tell that it would take a lot of pulling and tugging for the fitted sheet to become untucked. 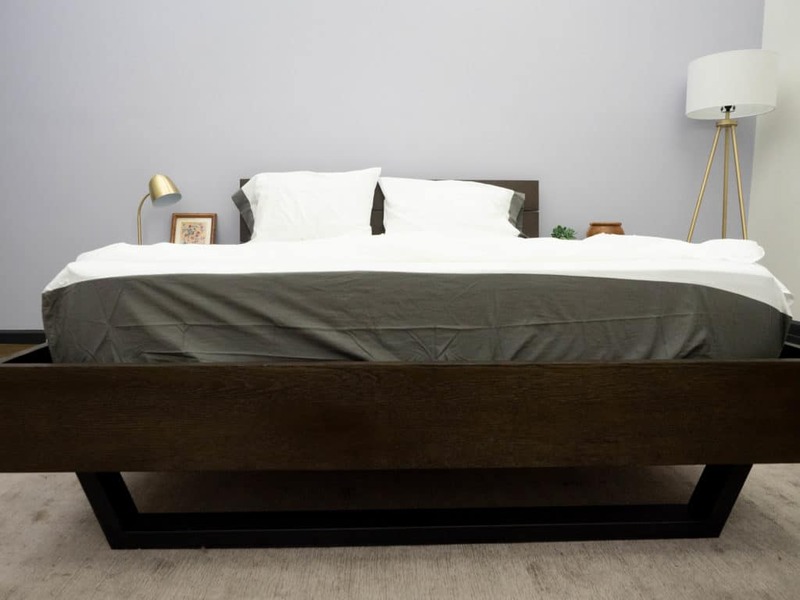 When it comes to sheets, I have two personal most-important-factors: how the fabric feels against my bare skin, and how well the fitted sheet stays on the mattress. That’s not to say that I don’t take plenty of other factors into consideration, but if they don’t feel great on my skin or keep coming untucked from the mattress, it’s an immediate no-go for me! That being said, I love the way these sheets feel. As I mentioned, they offer a really soft crispness that makes me feel luxuriously relaxed. I loved rubbing my arms and legs all over the material, and no matter how much rolling around I did, that fitted sheet stayed firmly put. Not to mention, even though I don’t have allergies, I do have sensitive skin so I was comforted to know that these are naturally hypoallergenic. So, with my two main criteria checked off, I was feeling pretty satisfied. I did notice the rustling sound these sheets make when rolling around in bed. The crisp, percale weave is lovely, though it did contribute to the swishing sounds the sheets made. In my experience with cotton percale, the rustling crispness does fade after some wear and a couple go-rounds in the wash. Ultimately, the noise didn’t bother me much, but it’s something lighter sleepers may want to keep in mind. The material of these sheets did feel very lightweight and pretty cooling. Anyone who has read even one of my reviews knows that I am a hot sleeper, so I was pleased with how this set kept me feeling breezy and fresh. I would probably swap them out for something warm and cozy like flannel once the cold months creep, but until then — I love how cool they keep me! Overall, I think Casper’s Cool Supima Sheet Set would make a great addition to anyone’s bedroom. A durable, breathable, and oh-so-soft set of cotton percale sheets is a bedding essential, and I think these are a great pick. Easily Wrinkled — In my experience rolling around in these sheets, I found that they do wrinkle a little bit. Not so much so that it ruined my sleep experience or anything, but from an aesthetic standpoint — it’s not ideal. 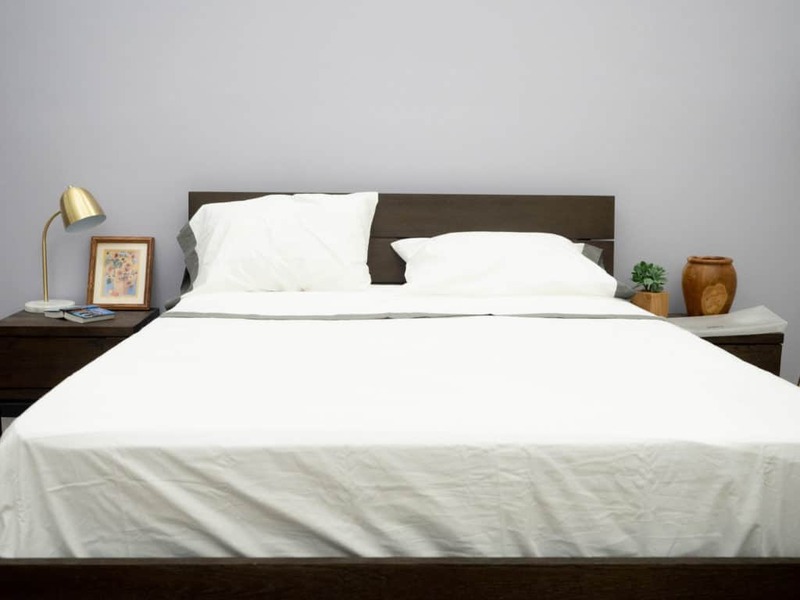 Percale woven sheets are a little more prone to wrinkling, so that’s something to be mindful of. Cool and Light — Another thing about these sheets is they definitely live up to the name Cool Supima. 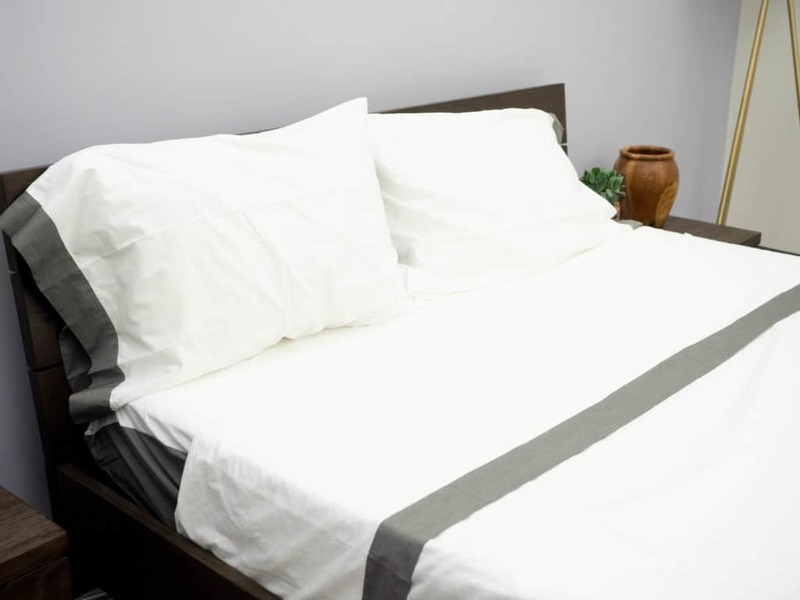 These sheets kept me quite cool and they have a very lightweight, breathable quality to them which is great for sleepers who heat up during the night. But if you’re looking for something a little more warm and cozy, you might want to test these first. Rustling Sound — Because these sheets have such a smooth, crisp feel, they do make a little noise when you rub against the fabric. I wouldn’t go so far as to call them noisy, but if you’re sensitive to sounds, test them out first. However, I will say that after a few trips through the washing and drying machines, that new-sheet-rustle sound dies down (and gets a bit more of that worn, cozy softness!). SHOULD I SLEEP ON THESE SHEETS? Sleep Warm — The thread-count, percale weave, and long-staple Supima cotton all work together to offer a really soft, crisp, and breathable feel. I’m a hot sleeper, so I love how cool and light these feel on my skin and would recommend them to folks prone to night sweats or warming up in the night. Prioritize Easy Care — These sheets are both machine washable and dryable, which makes caring for them pretty easy. Just be sure to wash on a cool, gentle cycle and tumble dry on low heat. Percale sheets are more prone to wrinkles, so if I were you I’d take them out of the dryer as soon as they are done so you can spread them out over your mattress when they are still warm and wrinkle-free! Like To Test First — Casper offers a very generous trial period of 100 nights so that you can try these sheets out before you fully commit. If the trial period ends and you feel like these sheets aren’t the right set for you, just send them back for a refund. Shipping & Returns — Free shipping is included with every order and returns are free as well. If you choose to return, Casper will send you a prepaid label. Get you new sheets from Casper today! The Casper sheets are made from 100% long staple California cotton. They have a two-tone, grey and white design along with a 200 thread count.